Even before I went plant based 🌱 I avoided eggs as I’m allergic to egg whites. Since then I’ve missed the comfort that egg mayo on soft seeded wholemeal bread can provide. Everything about it, the taste, the texture, the smell, immediately transports me back to the Christmas parties my parents and grandparents held when I was a child, where egg mayo, and other eighties sandwich fillings, would be served on open bread buns (yes, I’m from Yorkshire and in Yorkshire we call them buns not rolls 😜). If you’re not interested in the back story of you can click here to jump straight to the recipe. Anyway, as you can imagine it wasn’t quite as simple as adding black salt to vegan mayo, but after a few test batches I managed to perfect a recipe that is, in my mind, as close to the real thing as you’re going to get. The “mayo” element was pretty easy to get right as I was simply adding some extra ingredients to a favourite recipe. The “egg” element, on the other hand, was a little more tricky. I started out using Tofoo brand extra firm tofu. This is the brand that’s available in my local Sainsbury’s and one I use most frequently in other recipes. But this really didn’t work as an egg white substitute. It was way too firm and slightly mealy, especially when pressed. I also tried it unpressed, it was still mealy but too watery as well. The difficulty I ran in to at this point was the complete lack of availability of other types of tofu in British supermarkets and health food stores. It’s also really difficult to buy tofu online as it needs to be refrigerated. Luckily I live in London and we have the Japan Centre, purveyor of a things Japanese food and culture. So I took myself off to Piccadilly after work one evening and bought all of the tofu. After testing everything from medium through to extra-firm tofu I settled on medium-firm as the best substitute for egg white. It has just the right amount of bounce and bite once pressed and chopped. 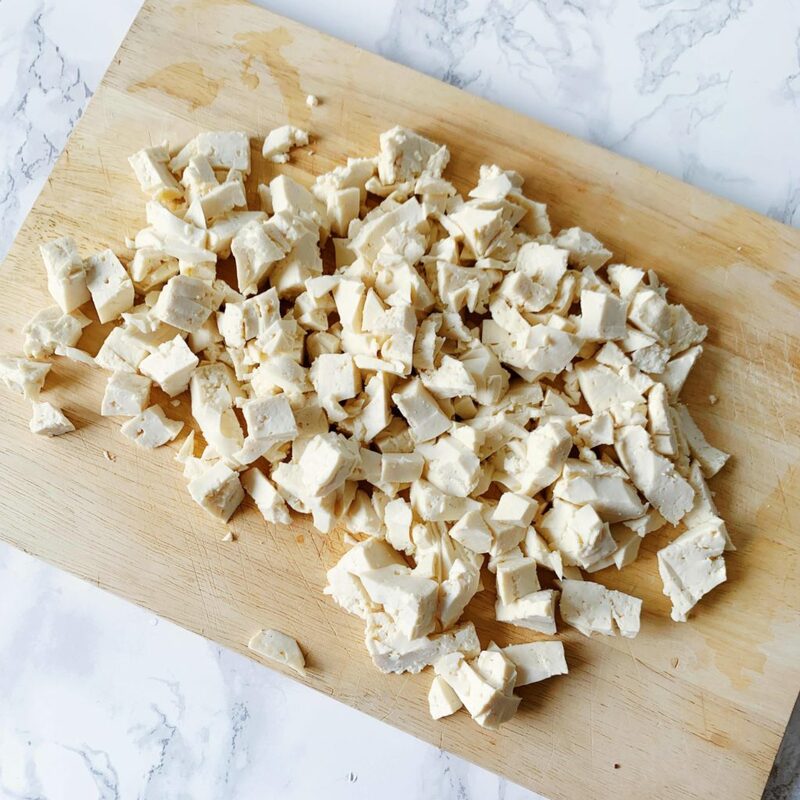 A key thing to remember when making this recipe is don’t skip pressing and drying the tofu, it’s a vital step that really does make a difference in the final texture and flavour. You don’t need any fancy equipment to press tofu. 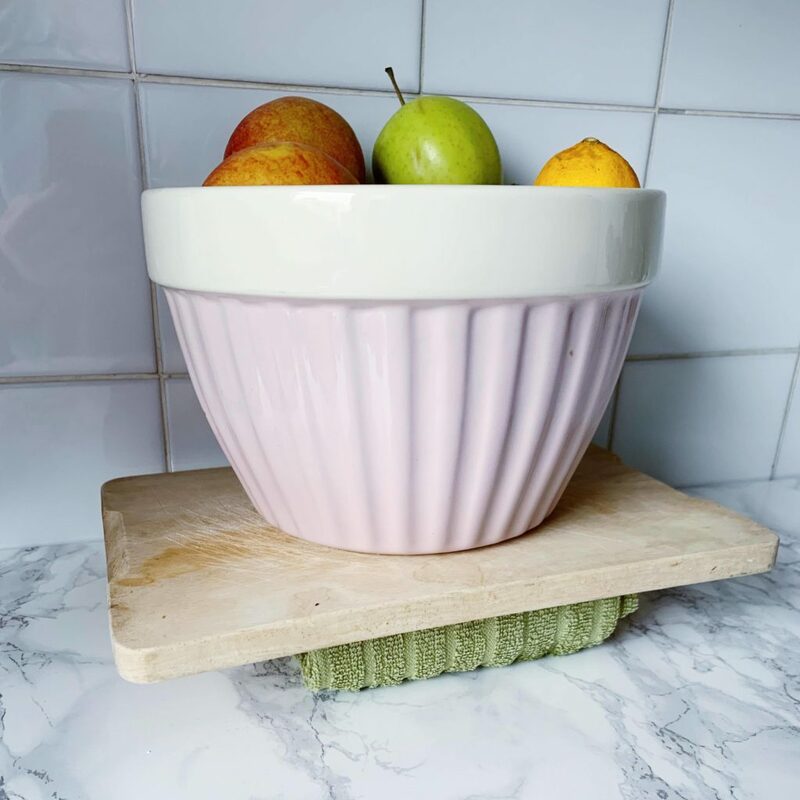 I used a clean tea towel, chopping board and my fruit bowl. I should also mention that the mayo in this recipe is oil and refined sugar free so this it’s great for anyone following an oil free / low fat / reduced calorie protocol. I’m following the Slimming World Food Optimising plan myself and this recipe is practically syn free at 1.25 syns for the whole recipe. I like to serve the finished product on wholemeal seeded bread or Rude Health Chickpea & Lentil crackers with spinach, tomato, cucumber and a sprinkle of garlic granules for that extra pop of flavour. If you try this recipe at home be sure to snap a pic or a story and tag me or use #kaleandcupcakes so I can take a look at your creations. You can also keep up to date with all the latest on Instagram & Bloglovin. Be sure to stop by and say hi! 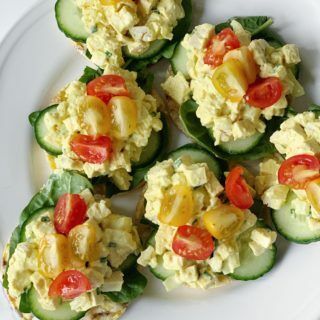 Epic Egg Free "Egg Mayo"
Drain both packs of tofu. Chop the silken tofu and leave to dry on a towel. Press the medium firm tofu for at least fifteen minutes. To a high speed blender add the silken tofu, Dijon mustard, kala namak (black salt), fresh lemon juice, apple cider vinegar, nutritional yeast, turmeric and stevia, and blend until completely smooth. While the dressing is blending, cut the pressed tofu to resemble chopped egg and add it to a mixing bowl. You can add the optional onion at this point if you want to add some extra crunch. Add half of the dressing to the tofu and mix thoroughly. Cut the chives finely into the mixture and stir again. At this point, depending on how saucy you’d like the final product to be, you can add more dressing. You can also add more kala namak (black salt) and pepper to taste. 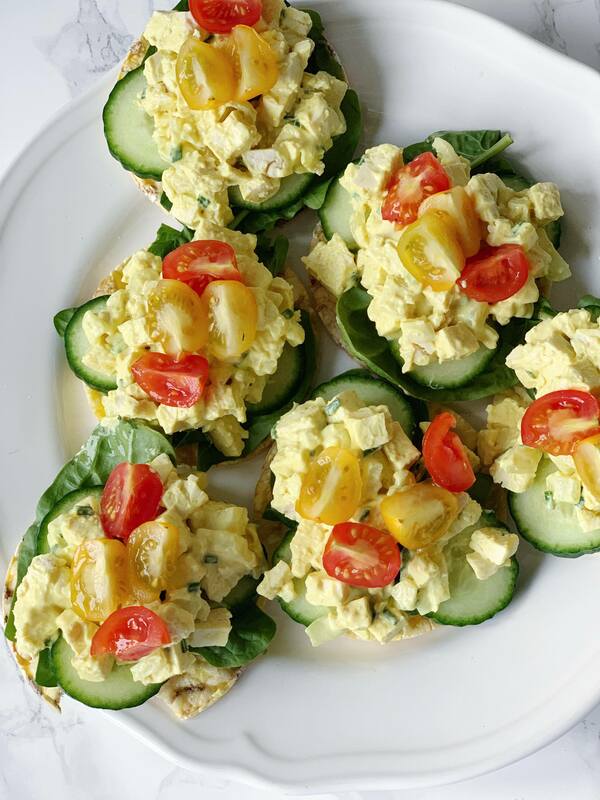 Serve immediately and refrigerate any leftovers, use within seven days. Any leftover dressing can also be refrigerated and used within seven days. Some separation may occur in the dressing when it is sat, a quick mix before serving should remedy this.